Observation - Black crustose lichen - UK and Ireland. Description: This tiny cluster of black spots was growing on the north east side of a rough granite barn. The cluster was barely an inch across and the small black domes were quite difficult to photograph. 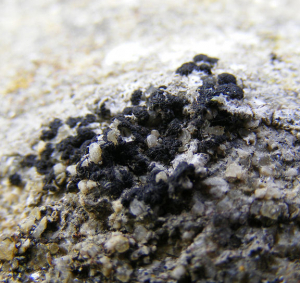 This tiny cluster of black spots was growing on the north east side of a rough granite barn. The cluster was barely an inch across and the small black domes were quite difficult to photograph.